In the latest instalment of our London W11 Meets series, we chat to editor and stylist Nini Khatiblou. 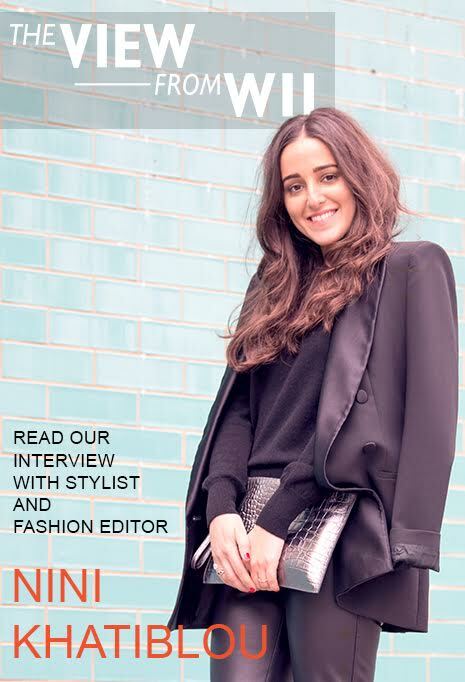 Nini is a London-based stylist and Fashion Editor, who has worked across some of the UK’s most renowned magazines. She currently splits her time between styling celebrity and fashion shoots for PHOENIX Digital and working with a host of exciting brands including London W11. We sat down with Nini to chat style muses, Notting Hill hotspots and style rules. When I was younger I worked in the cupboard at New Woman Magazine. I was surrounded by all these amazing clothes and accessories and everyone around me was so stylish – something just clicked inside me and overnight I became obsessed with clothes and fashion. I split my time between working for PHOENIX Magazine and styling for a range of womenswear brands. It couldn’t be more different to a 9 to 5 job! I love the variety of work, and constantly meeting and working with new people. nder a super sharp blazer and a pair of statement flats. Absolutely everywhere; Instagram and Pinterest always play a huge role when I’m looking for shoot inspiration. I also find travelling and people-watching abroad hugely inspiring too. What’s your number 1 style rule? Take time to discover what your style is and run with it. Find the colours and shapes that suit you and then build a wardrobe of items that all work together. There’s nothing worse than wearing an outfit and not feeling good in it. Whose style do you covet the most and why? I’ve always been a huge fan of the same four celebrities – the Olsen Twins, Alexa Chung and Sienna Miller. They all make fashion look totally effortless. You can tell they dress for themselves which I find really empowering. I’ve been a fan of the brand for quite some time now – the quality and versatility of the designs is everything that I look for when I’m shopping for new clothes. The raw edge cashmere crew neck in black is at the top of my wish list. You’ll often find me enjoying a spot of brunch outside Nicole’s in Westbourne Grove; it almost feels like you’re in Paris! My dinner plans tend to be quite low-key; I’m a regular at Lemonia in Primrose Hill, they do the most amazing sharing starters and moussaka. For drinks with friends, Soho is my preferred choice; there’s such a lively energy and welcoming feel to the area. I think Italy has to be my favourite; a big bowl of pasta near the beach and plenty of sunshine is all I need for the perfect holiday. When I’m not working, my favourite ways to switch off mainly involve cooking and exercising. I love being in the kitchen with the radio on. Equally, I find exercising and running ideal for clearing my head. I pop in my headphones, map a run and forget all about my work stress. For centuries, upper class white men dominated art as a medium. 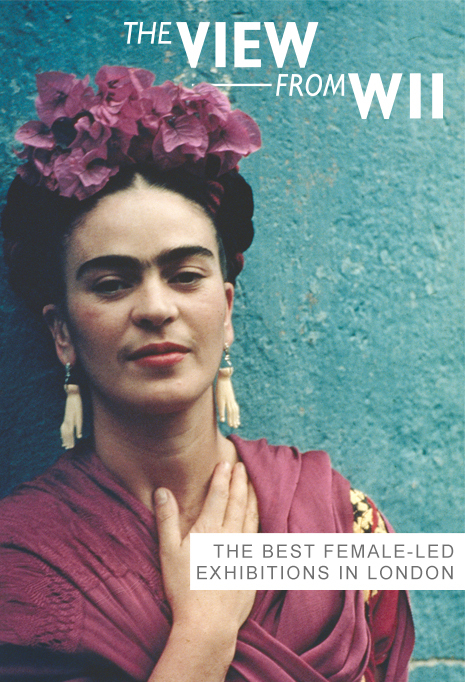 It was trailblazers such as Frida Kahlo and Joan Jonas who carved out a space for female artists. Today, women’s art is something to be celebrated, both in its own right and because of its inherently gendered (and politicised) position. To honour this celebration, we present the top five female-led exhibitions in London, from Baroque paintings to a curation of Frida Kahlo’s cosmetics. After 50 years of being sealed away by her husband, Frida Kahlo’s wardrobe was uncovered in 2004. Never before shown outside of Mexico, this V&A exhibition presents a carefully curated selection of personal artefacts, including her famous embroidered clothing, blusher and lipsticks, as well as her red-booted prosthetic leg. 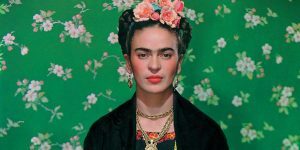 As Kahlo suffered from physical ailments throughout her life, this exhibition shows just how important clothing can be for an individual in shaping and transforming their identities. 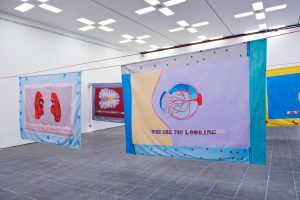 After becoming the oldest Turner Prize winner in 2017, Himid has taken to the Baltic Centre for her latest exhibition. Our Kisses Are Petals features paintings on cloth that resemble the style of the Kanga, a fabric traditionally worn by East African women. The pieces are each inscribed with words from poets including James Baldwin, Essex Hemphill and Audre Lorde, creating what Himid describes as ‘speaking clothes’. The cloths are hung in a flag-like and nationalistic fashion, disrupting expectations and subverting notions of identity and what ‘belonging’ means today. 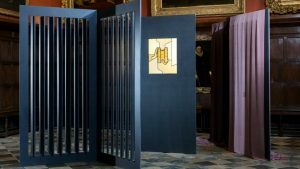 With the Representation of the People Act celebrating its centenary this year, the stately home at Knole is presenting the work of six contemporary artists throughout its house and grounds. The exhibition focuses on the progression of women that have contributed to the history of the National Trust property, shining a light specifically on the untold stories of its women. Highlights include letter extracts from Anne Clifford and Frances Cranfield and specially commissioned works from Melanie Wilson, Lindsay Seers and Emily Speed. 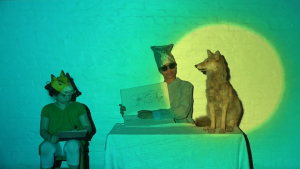 One of the most important female artists to emerge from the 60s and 70s and pioneer of video and performance, Joan Jonas continues to produce work at the age of 82. 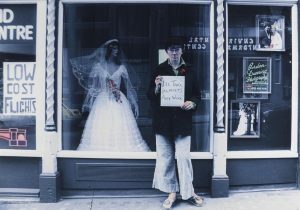 This exhibition is the largest collection of Jonas’s work ever held in the UK, and houses her early work from the 60s through to more recent installations. Exploring topics such as feminism, sexuality and climate change, Jonas’s creations remain as poignant and as relevant as they were when she began her work. The Walk Through British Art exhibition at the Tate Britain contains a virtual tour of its selection of women’s art throughout history, inspired by the 100th anniversary of the Representation of the People Act. The online collection presents a curated selection of paintings by prominent female artists from the 17th century through to modern day, including Evelyn John, Bridget Riley and Mary Beale, allowing you to take yourself on a handpicked tour of some of Britain’s finest art.